Sometimes called the "Royal Game" or the "Game of Kings", Chess is one of the oldest games of skill, having originated in Asia – where two related games, Xiangqi (Chinese Chess) and Shogi (Japanese Chess), are still popular – and reaching Europe by the 15th century. 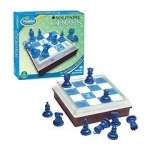 Since then, the game has been standardized and internationalized, and is now known as "Western Chess". It remains incredibly popular today, and is prized for its simple rules yet endless strategic depth. 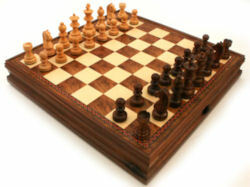 Chess is played on a game board made up of 64 squares, alternately dark and light in color. Each player starts with sixteen chessmen, either white or black. Pieces are set down in a particular starting formation. 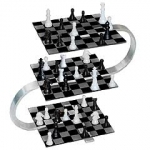 Each different type of piece is moved according to specific rules and is removed from the board when it is captured by the opponent. The object is to "checkmate" the opponent's king. Obviously, this description doesn't begin to scratch the surface of this elegant and engaging abstract strategy game. To learn more about the game, check out some of our Chess Books and Chess Links, or download some Chess Software to help teach you the game.